Khloe Kardashian Tying the Knot Sunday! Reality star Khloe Kardashian isn't wasting any time on wedding plans or details -- the youngest Kardashian sister is set to marry her Lakers beau this Sunday! Khloe will say "I do" to Lamar Odom, a Los Angeles Lakers forward. A source dished to Us Weekly, "Khloe and Lamar want to get married before Lamar has to go away for training and the basketball season starts up." The Lakers are scheduled for their first pre-season game on October 7. The intimate nuptials will take place at the home of music manager Irving Azoff, a friend of the Kardashian family. 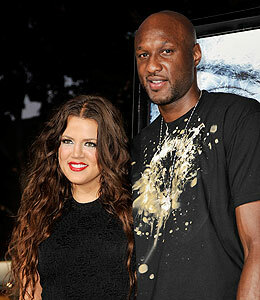 Kardashian, 25, and Odom, 29, want to marry in time to have a quick honeymoon before basketball season. "They are hoping to pull together a wedding... so they can get married and have time for a honeymoon." Khloe and Lamar have been dating since last month.